Okay, first problem. 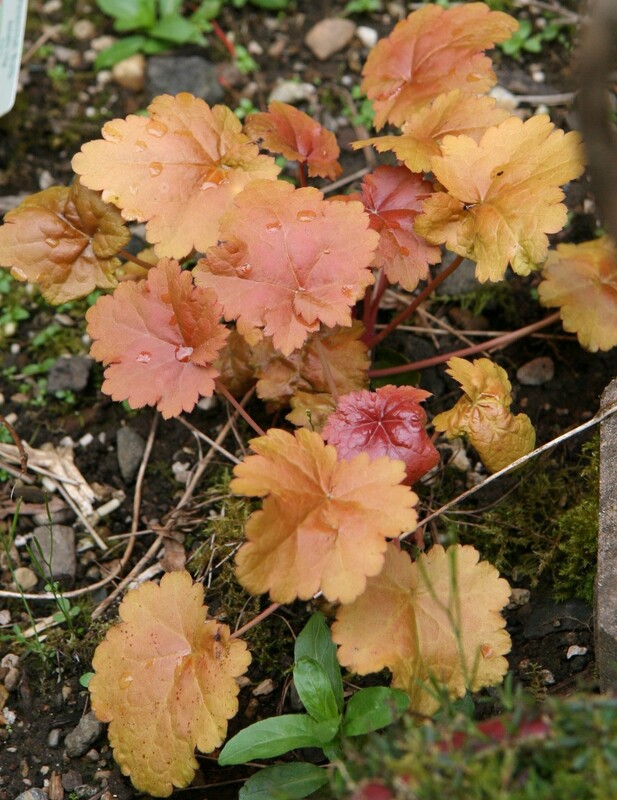 Lily of the Valley or Coral Bells? 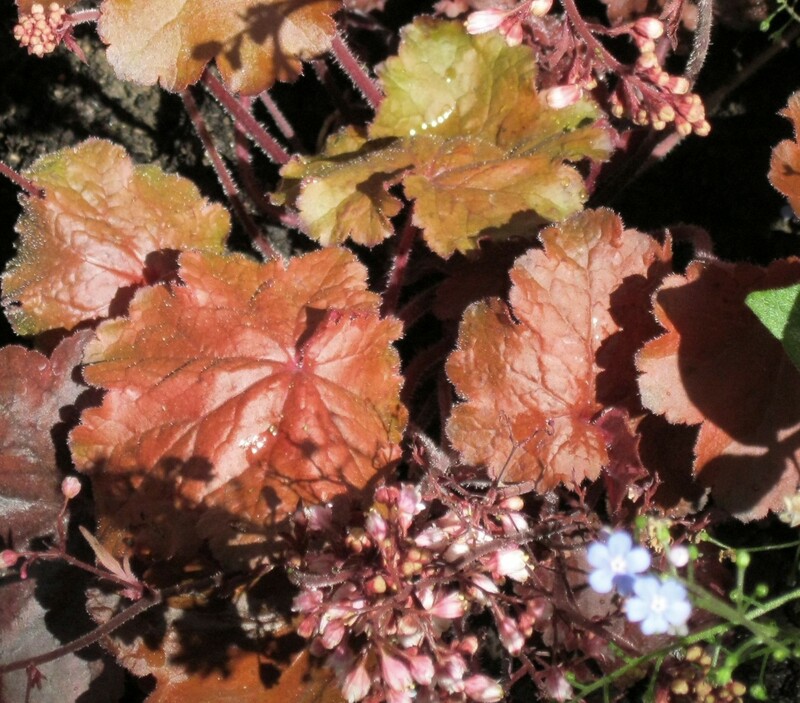 Coral bells luckily are not hardly ever white and who cares about their flowers. Its the leaves that make us collectors crazy to acquire each new one that shows up. 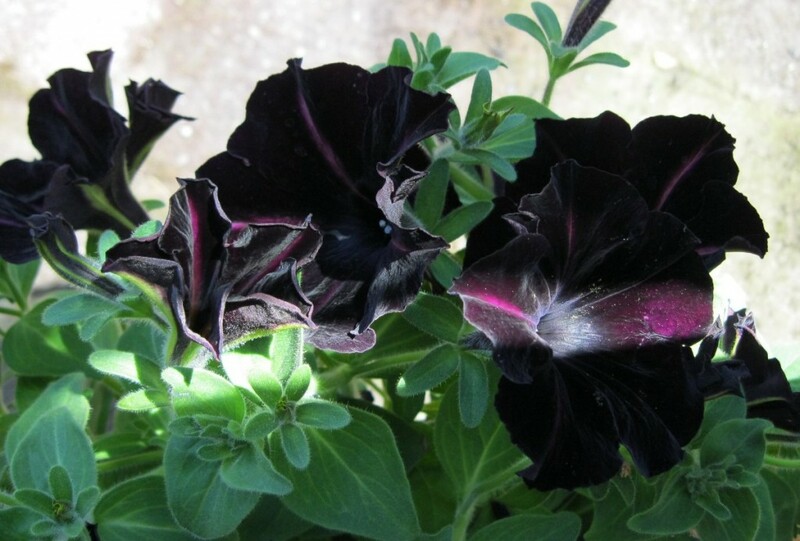 I started the day by planting my new pet petunia, Pin stripe. Purple black and yellow striped. How cool is this? 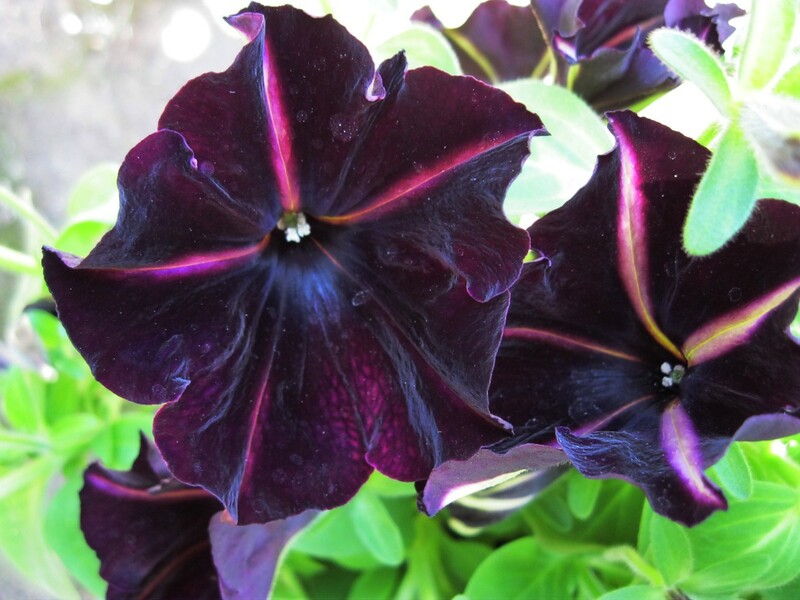 Another shot of the purple petunia. I had my Canon A3000 in one hand and a trowel in the other. 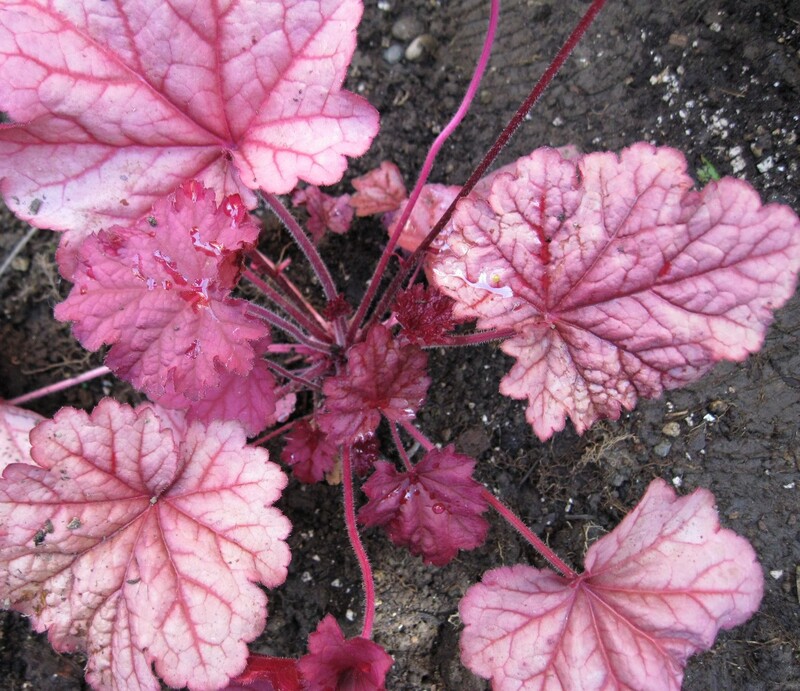 Morning light is wonderful and saturated, showing off the Heucheras in the Rabbit garden. They have lovely names, Snow Angel, Berry Smoothie, Lime Rickey, Georgia Peach, Creme Brulee and Obsidian. Of course I had to get a shot of my favorite gardent thing. I remind myself to take it easy every time I see it. That’s the new pink climbing hydrangea in the background heading northward to the trellis which is made from an old bed frame. Somewhere along the line I seem to have let go of most flowers, except for purple and blue, and decided to chase striking foliage. 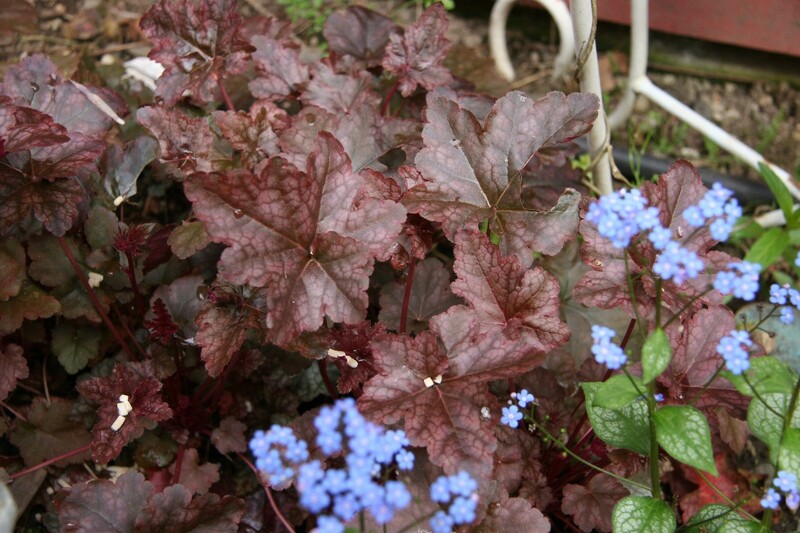 I have Hostas and Heucheras in my gardens and they definitely fill the color bill. 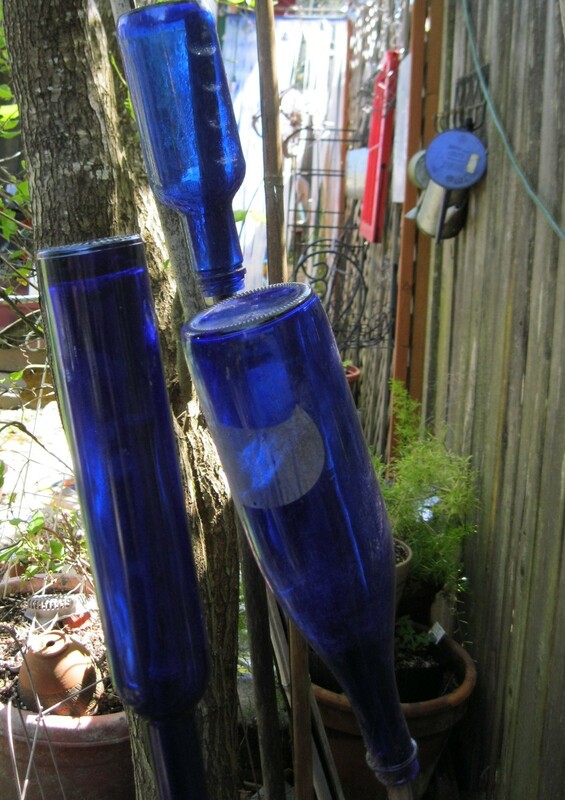 Okay, I have a bazillion statues of rabbits hiding, my collection of suns and I definitely have a thing for blue bottles. Color is probably not an issue. I gave myself three new stunners for my birthday, Berry Smoothie, Fire Chief and Obsidian. I went to get Obsidian but I couldn’t resist the other two! Berry Smoothie, has raspberry colored leaves! 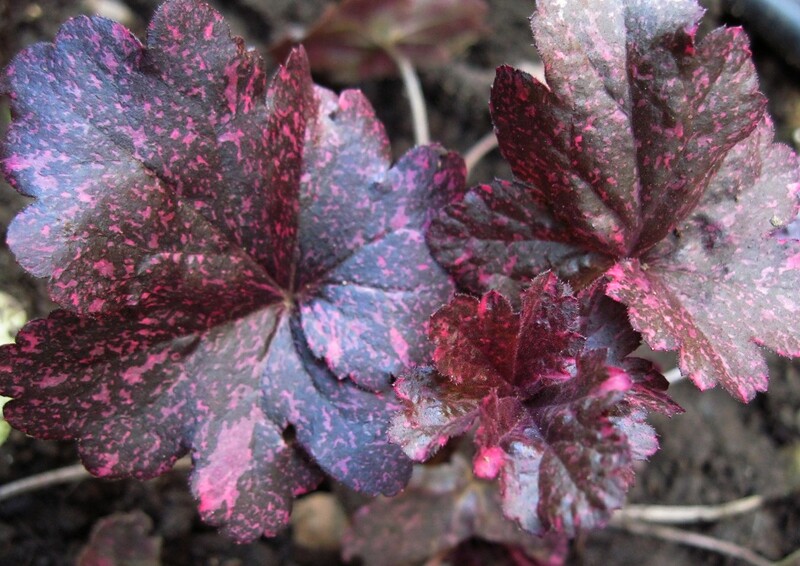 I am so drawn to these plants, I have a list, I want Beaujolais, Frosted Violet and Sashay next. 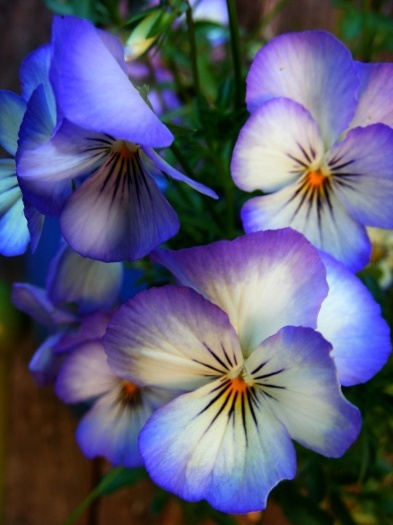 The green ones are a great contrast to the purples and oranges. Obsidian, so close to black its beautiful. I've lusting after this for months. I have Citronelle, Key Lime Pie and Lime Rickey in the green family. I hope more are coming. The greens are so bright they don’t even look real. Citronelle, and that's the corner of Midnight Rose showing on the right. 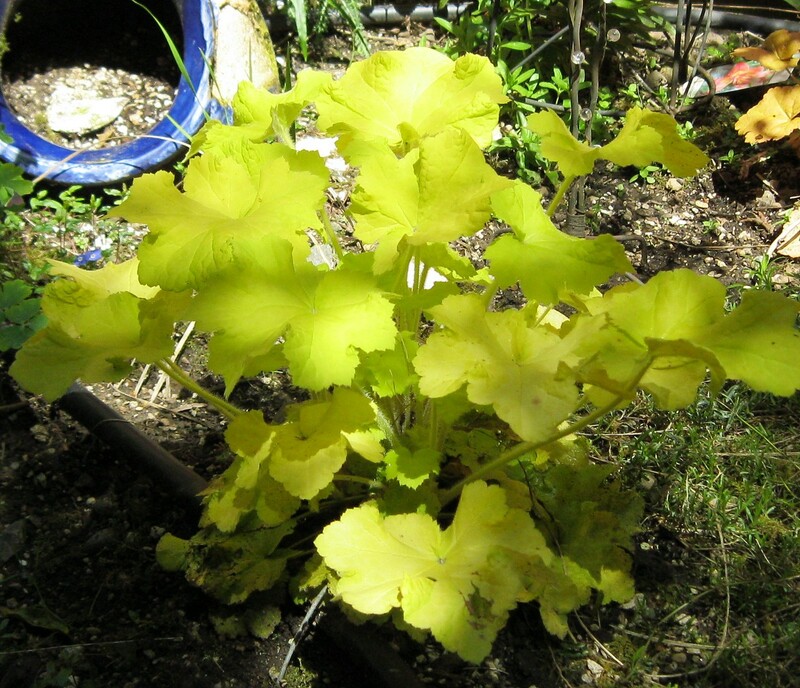 Creme Brulee, what a warm yummy color, I'm angling for its cousin Caramel too. Midnight rose is pretty amazingly two toned too. This is Fire Chief, with a fireman husband, how could I resist? This entry was posted in Life in the Garden, Uncategorized and tagged heucheras on May 20, 2011 by rox. 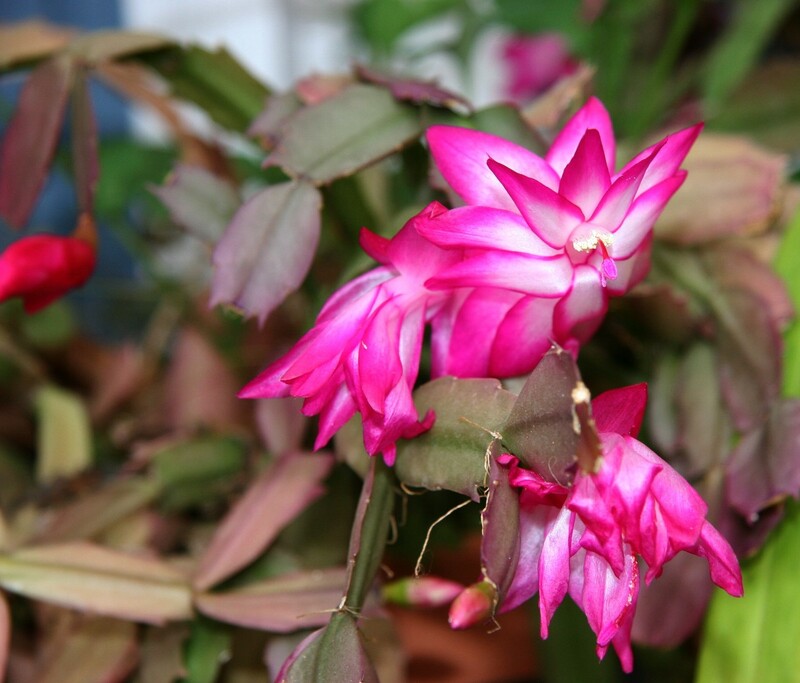 This Christmas cactus is a birthday cactus, it lives in the greenhouse all winter and comes out in May to celebrate my birthday. 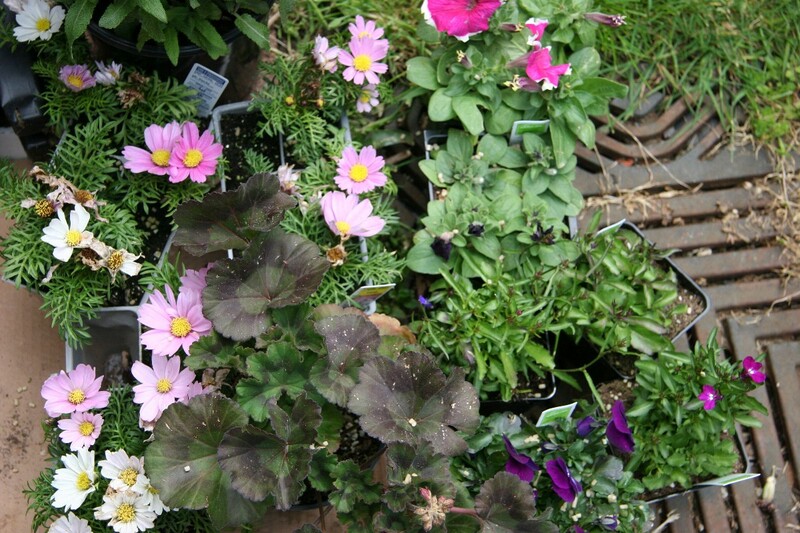 Hooray, Hooray it’s the month of May, outdoor gardening comes to stay! I think we are past the potential for a hard freeze in the Pacific Northwest so the greenhouse door is open. The residents are getting used to cold nights and warm days before they make their potted progression to their summer spots. 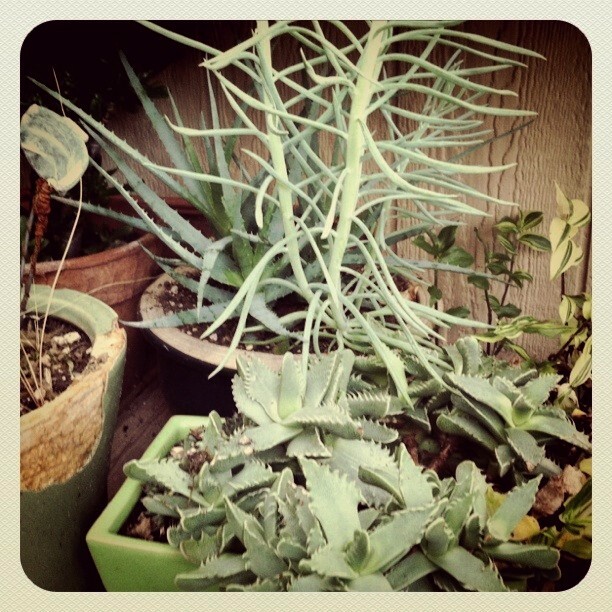 All my cacti and succulents are looking forward to going back to their west facing bed in the next two weeks. 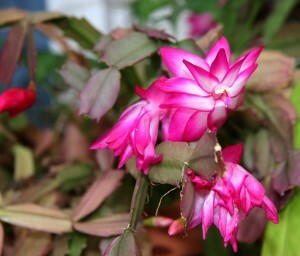 Winter in the greenhouse is coming to an end. The hostas have poked their noses out and are in the process of unfurling their gorgeous green leaves. Somewhere along the line I discovered the beauty in these plants that are so similar but each one is so different when you look closely. Little ones, enormous ones, yellow striped and blue-green striped, and as long as I put slug bait out they just get more beautiful by the day. 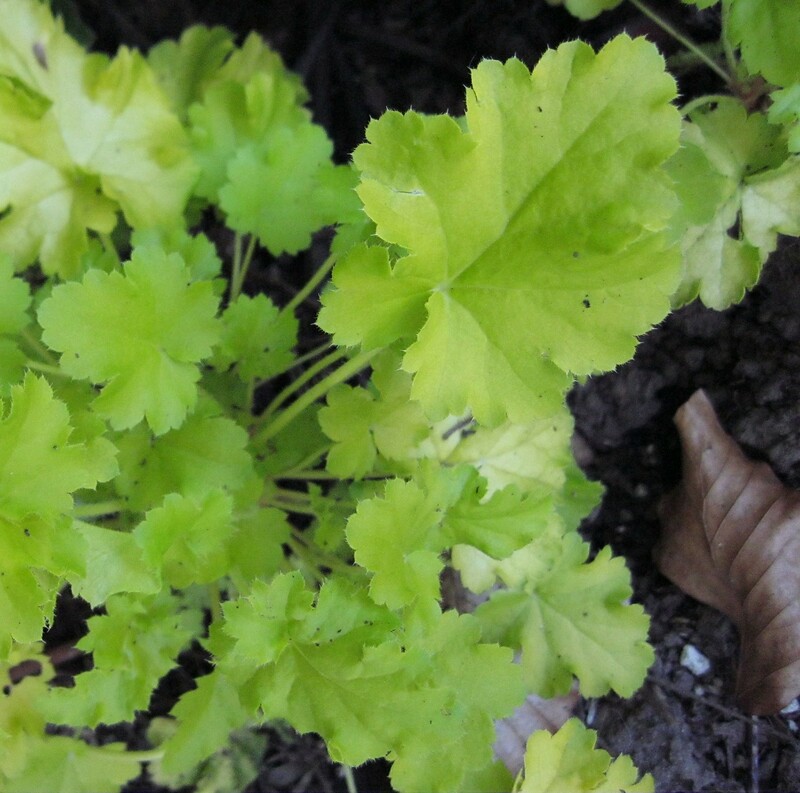 I used to love a huge variety of brightly colored annuals, but over the last few years I have discovered the subtle pleasure of the same genus in a wide variety. 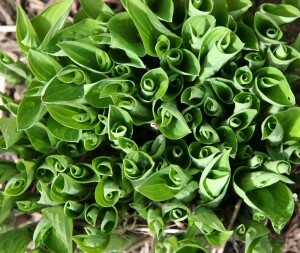 Don't these look like a green bouquet? 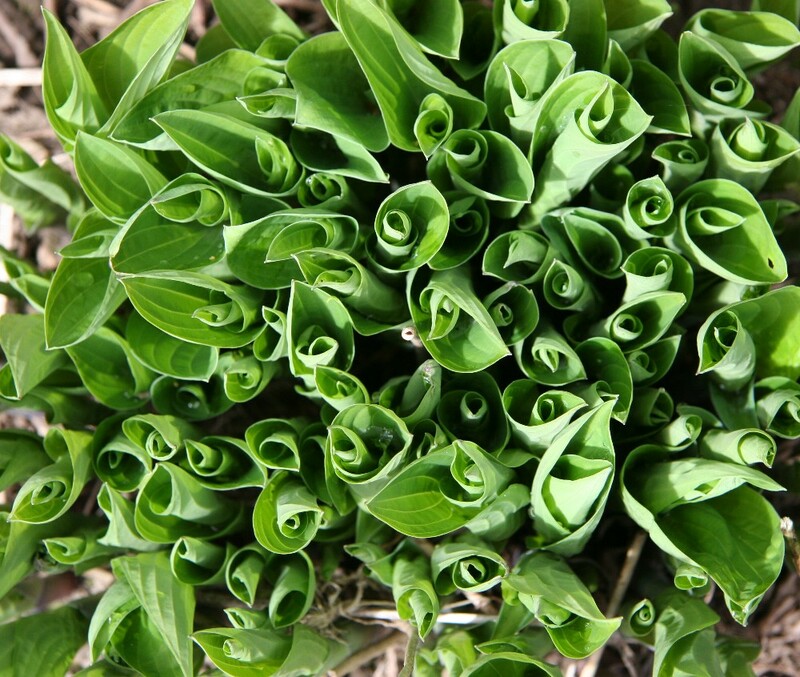 Tightly furled hostas about ready to explode. I have yellow ones, and green ones and blue green ones, and little ones and giant ones. 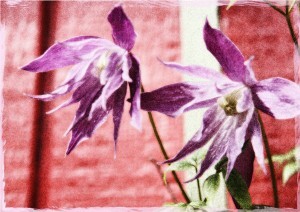 they love the shade and they are just plain beautiful in the middle of summer. 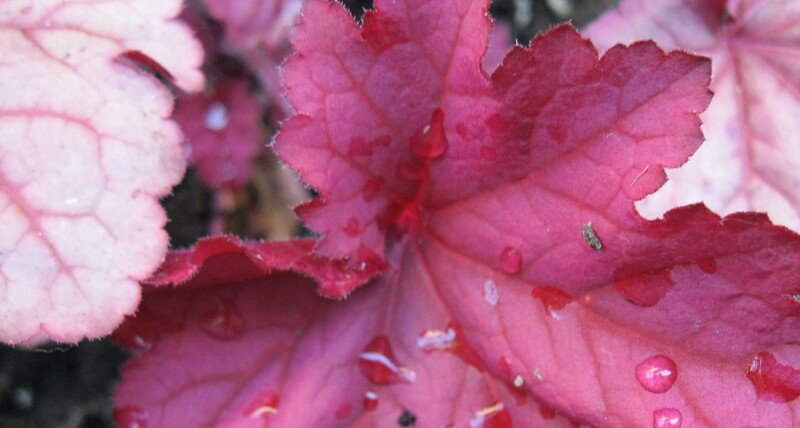 I am a collector I think, I have a collection of Hostas, aka Plaintain Lily; and a collection of Heuchera, aka coral bells. 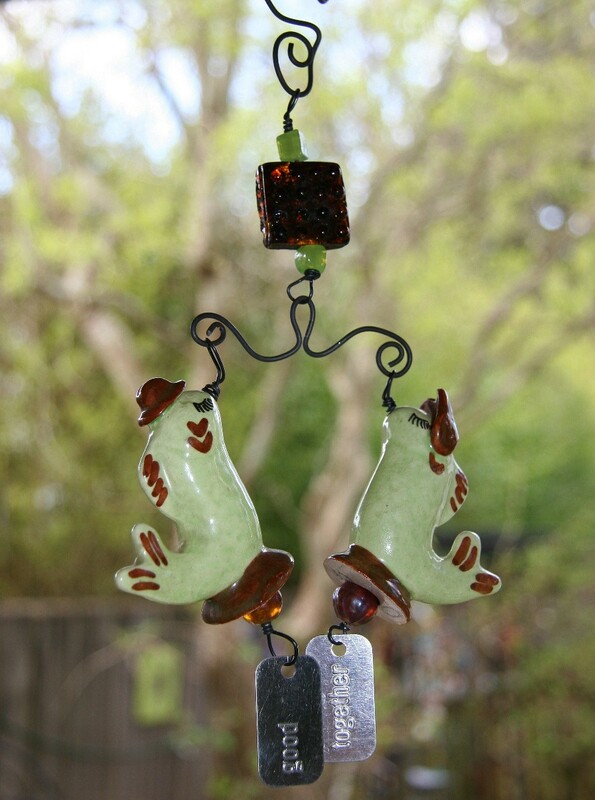 They come in an unbelievably diverse range of colors and sizes. 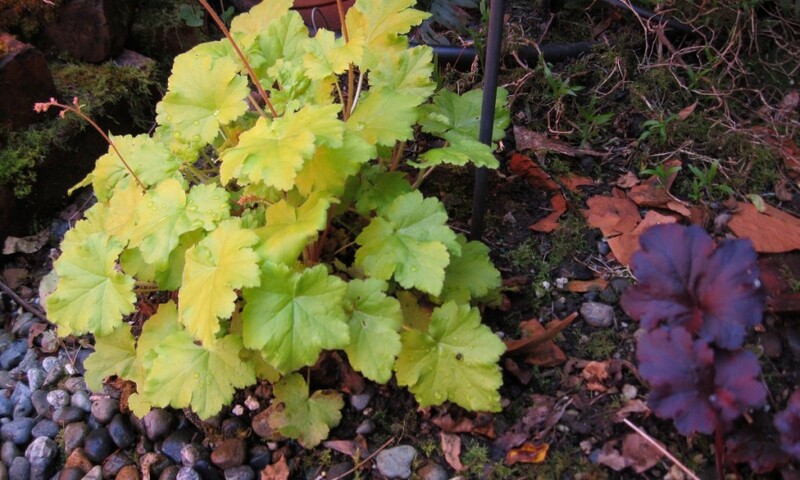 Heuchera's are a pop of color with just their leaves.This one is called Limelight. 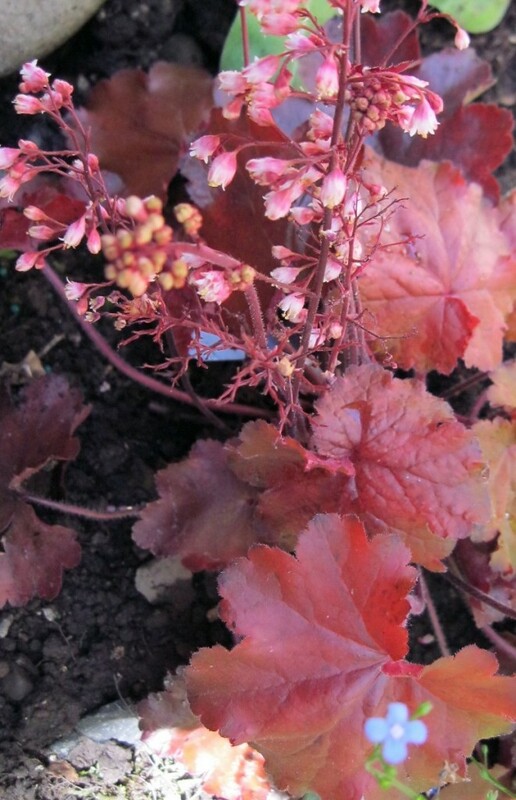 This heuchera is called Creme Brulee, great name! I buy Sluggo slug bait by the wagon load. Its non-toxic to pets and birds and that is so important. 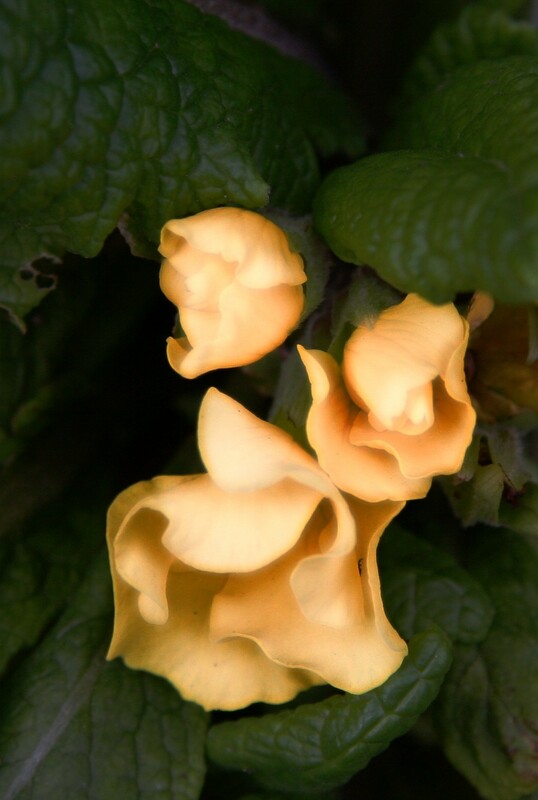 I thoroughly enjoy strolling in the gardens at night in high summer with a flashlight and saltshaker taking revenge on slugs. If you salt those nasty buggers they melt like the witch in the Wizard of Oz. Take a pair of slug tongs and drop them in a can, you don’t want to salt the foliage of your favorite plant. I’m already putting slug bait out because if I don’t my lilies will be lily nubbins in no time. Perennial forget me nots are great, the annual ones get mildewy and infect a garden. Every year I wind up fighting the self sowing annual beasts and loving this one. 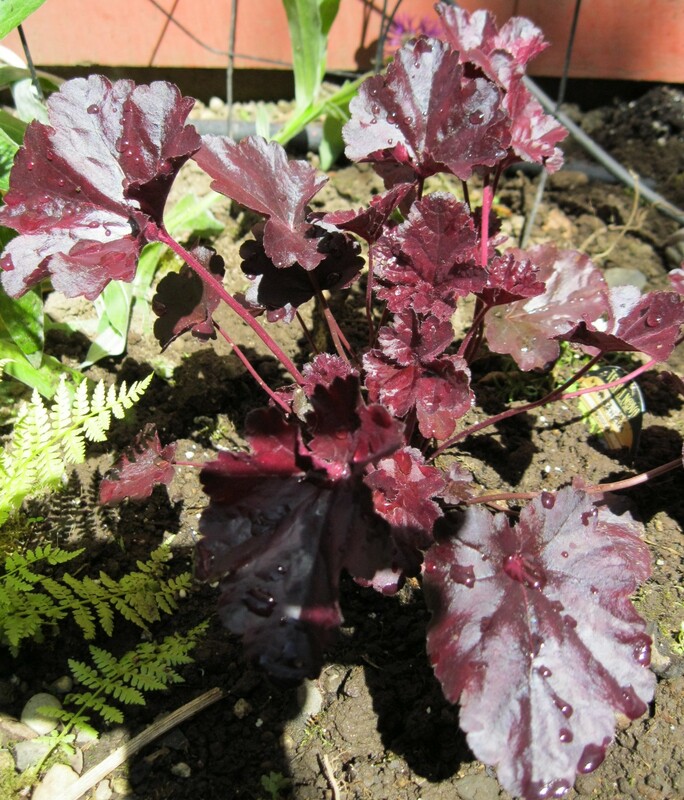 The end of winter weeding is mostly done, a big patch of vegetable garden still waits for attention, but the main gardens and beds have been de-weeded. I noticed yesterday that outside the gate in the two front beds where my roses live I am going to need to go back and rip up more dandelions, endless…. 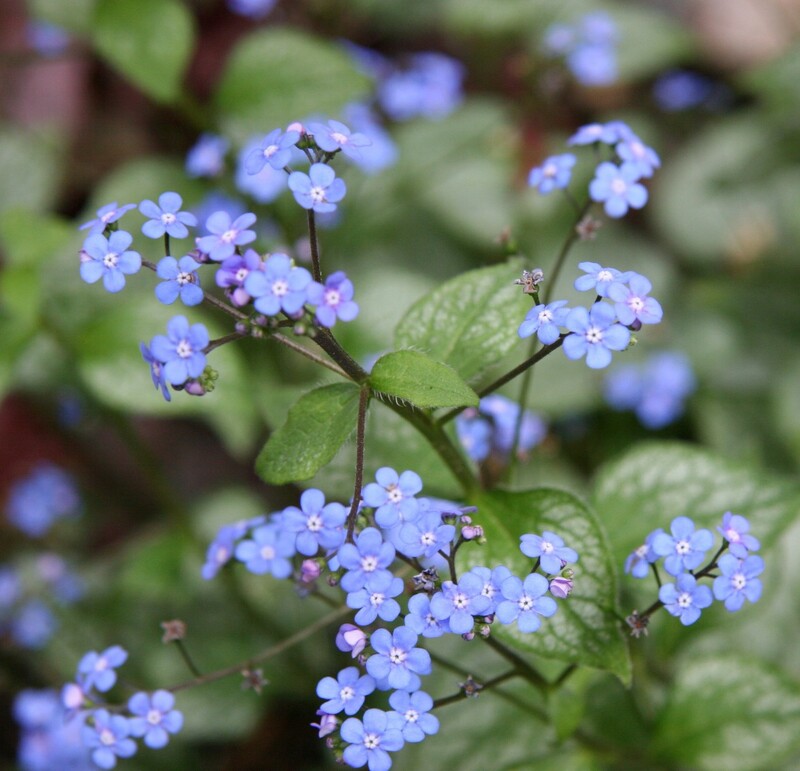 Couldn't resist these pops of color that will go in pots all over the gardens. I love May in my Rabbit Garden. The bunnies are back in place now that the hard freezes are past. I always put away the garden ornaments in the winter in the studio storage room, I do it so they won’t get water in them and then freeze and have pieces spall and split off. Love that word, its an engineer’s word. Spall, meaning to break off and fall, perfect no? I have so many bunnies hiding in that garden that it takes the massive foliage of summer to give them hiding places. I want them to peek out and surprise, not look like Granny Clampett has been in the Wal Mart garden shop again. 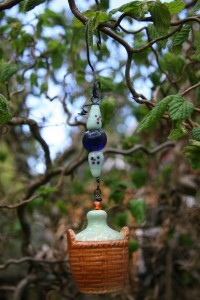 I’ve been working on beautiful garden hangers from some wonderful old salt shakers from the 20’s and 30’s. They look gorgeous in the garden and can be purchased for $18 each. 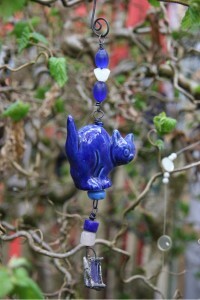 Scary blue kitty with cobalt beads would look great hanging in something green in the garden. The hydrangeas are covered with little green leaves and so is the kudzu of the northwest, aka kiwi vines. I’m still getting my mojo up to give the kiwi’s a haircut before they take over the world. The blackberries need a trim and the grapevine will too if we want great berries and grapes this year. My poor pond! Its clear but covered with green nasty slimy mossy weed. Sigh, time to empty it and scrub it down. That’s an evil job and I’m stalling as long as I can before I tackle it. I’m sure Misha will attempt to help, he was born this past November so any of the yard work is just fun, fun, fun for him. I love this tiny little porcelain shaker that looks like a straw covered jug. I paired it with green and blue beads and it will look great dangling from a plant this summer. Last weekend Terry and I visited Edmonds to see Manya Vee Selects shop, it was so cool and I got a great hat and a wonderful ferry ride out of it too. I also discovered an adorabale shop called Bountiful Home that made me want to empty my southwestern house and start over with shabby chic. Adorable! House stuff and a sweet plant nursery in one, I do want to go back and pick up some of their old wire baskets and containers next month, they’ll look fab in the pergola out front. Vintage Japanese luster ware owl for the wise gardener! The wicker furniture has all migrated to the front and the cushions will come out soon. The pergola is our outdoor room in the summer and we live out there in the middle of the gardens. 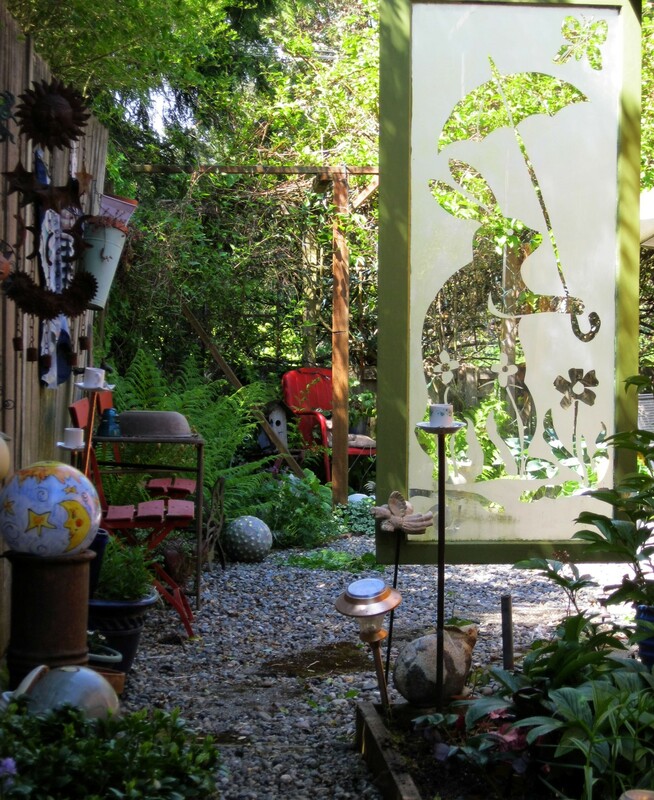 I am planning an open studio art sale and show in late June and in July and really looking forward to having visitors come and enjoy my perfect little world. Talk about a pop of color! 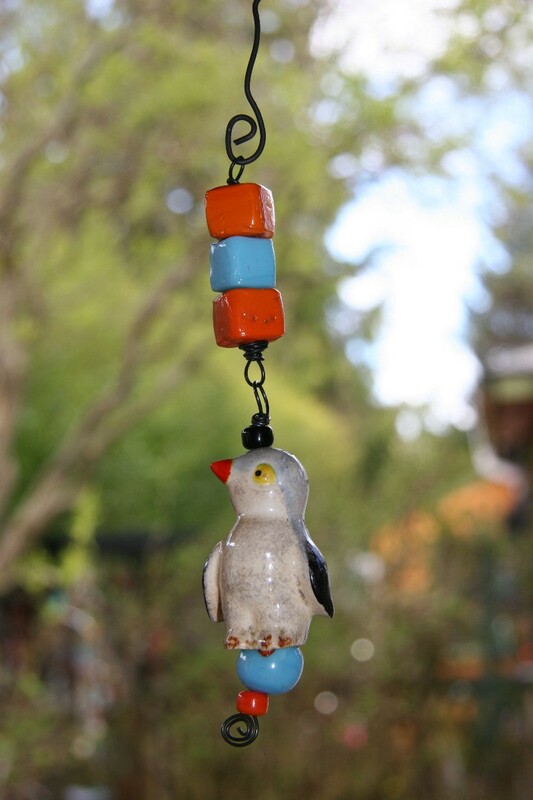 Mr Penguin has turquoise blue and orange beads for a 50's retro look. 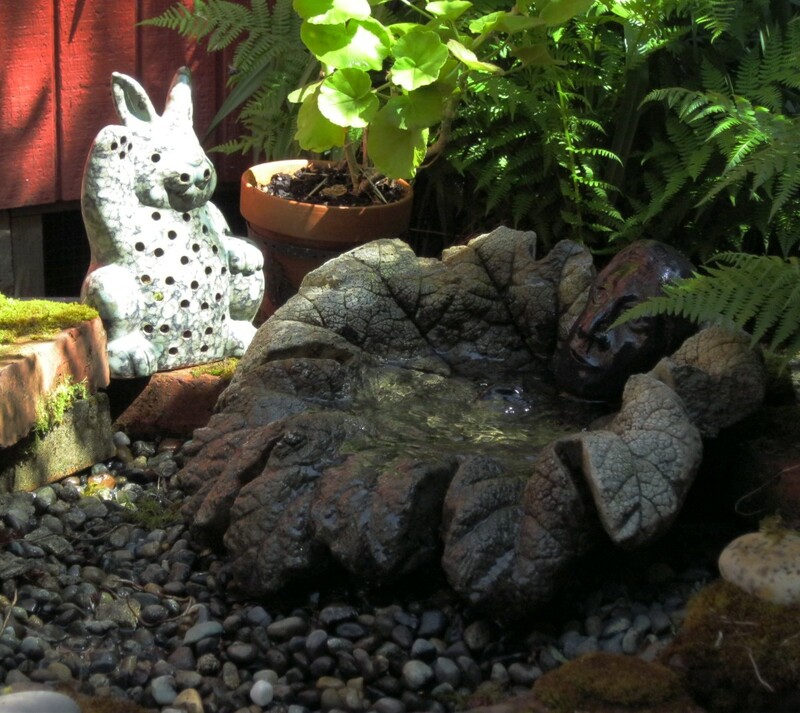 The sun is out, the air is warming, time for another cup of coffee outside where I can listen to the gurgle of the pond waterfalling and watch the chickadeedles having their morning bath. 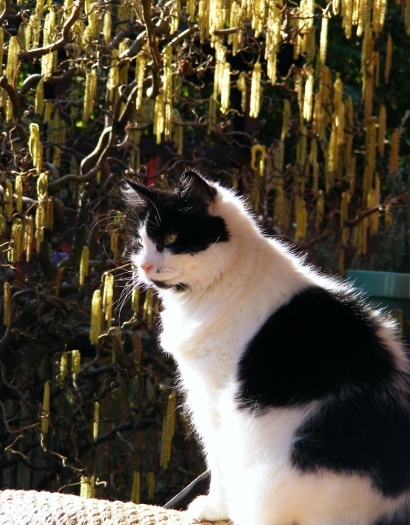 This entry was posted in Life in the Garden, Uncategorized on May 3, 2011 by rox. 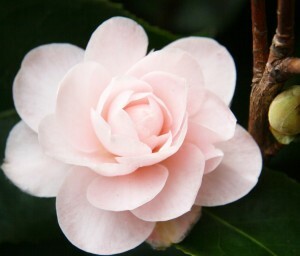 Is it possible to take a bad picture of a tiny pink camellia? I still can’t decide if I love or hate this time of year. I’m in the season of taking up the tools and scraping winter out of the flower beds and beating the weeds into submission before they take over. 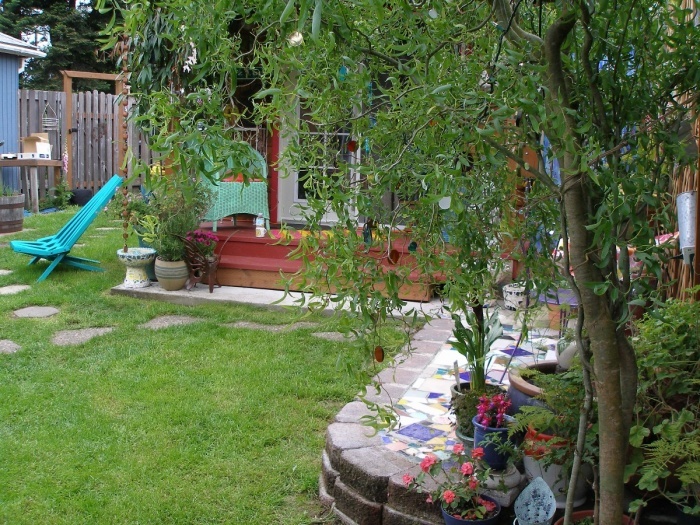 Its been hard to get into the yard this year because the studio is so seductive and so many projects are sprawled from pillar to post begging for attention. These look like vertical lilies, so beautiful. 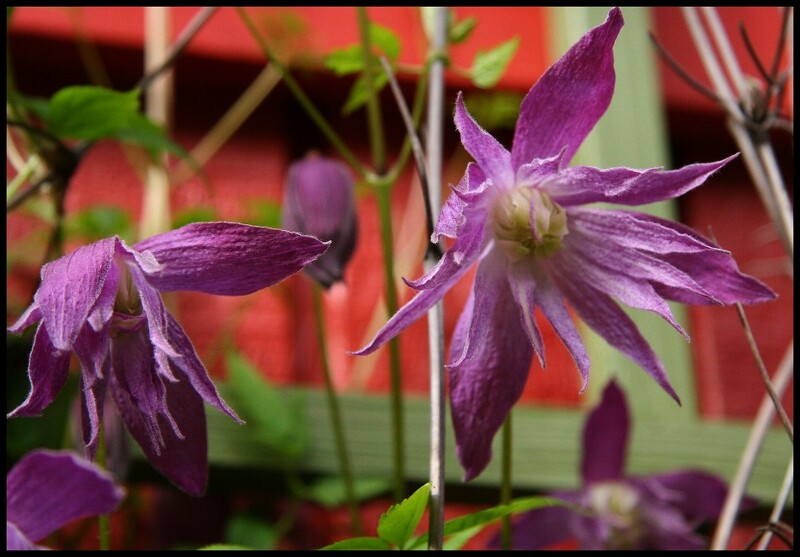 The garden won today and my reward for three back breaking hours of weeding was to discover my gorgeous and delicate early clematis in full flower. 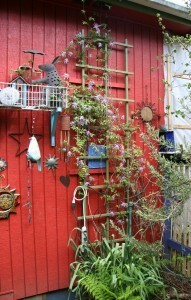 It looks like lilies from a lily pond gone vertical, even better, the amethyst flowers look amazing against the red wall in the rabbit garden. 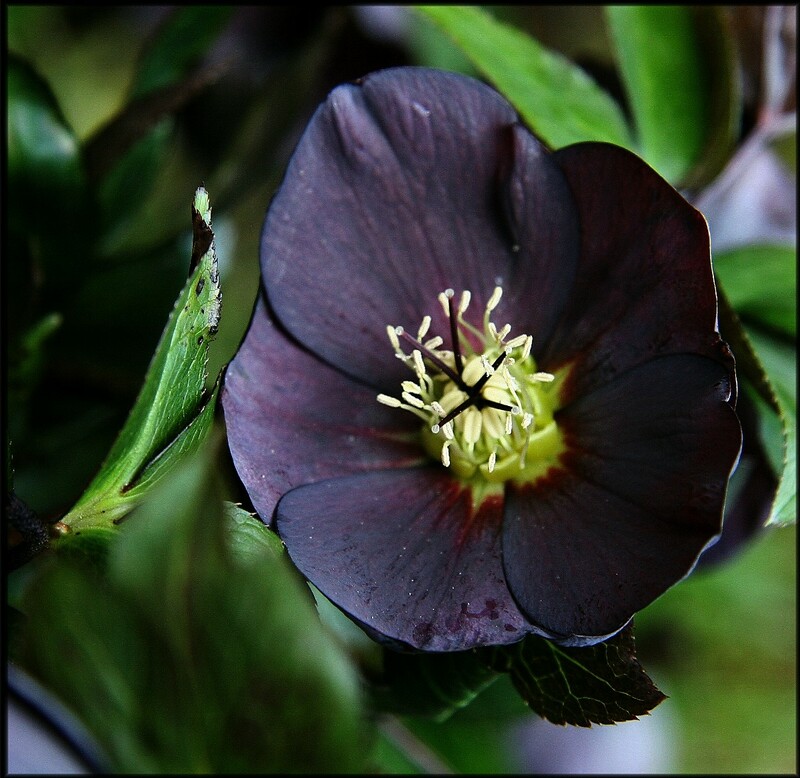 The Lenten rose, Helleborus Nigella, is beautiful now with its blackish purple flowers and tiny violets are scrambling out of their pots around its ankles. Alas, there is more to do still. 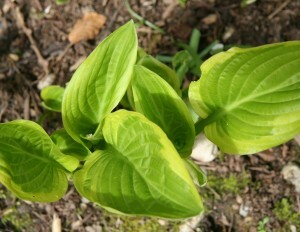 The fat green noses of the hostas are above the ground now in the front beds. 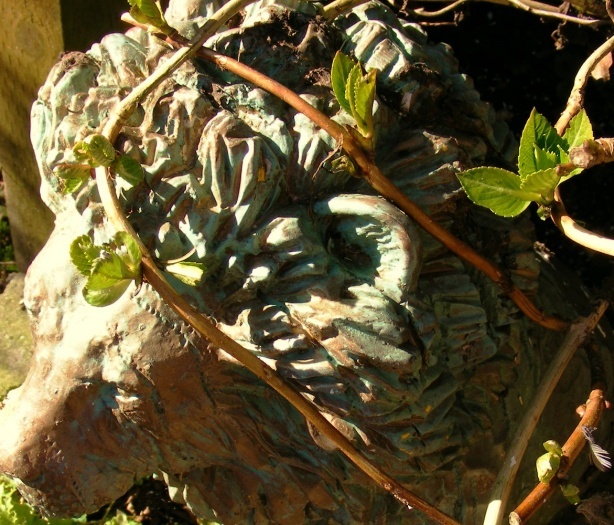 I managed to eliminate all the moss from their beds and clip off last year’s hydrangea heads too. The copper beech always amuses me, it looks dead as a door nail in the corner of the hydrangea bed, all covered with brown crispy leaves. In about three weeks. BOOM! 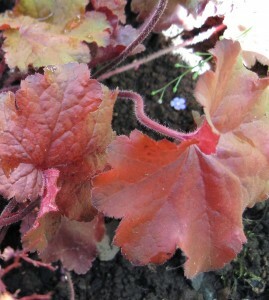 Those leaves will drop overnight and it will be covered with pinkish copper leaves. 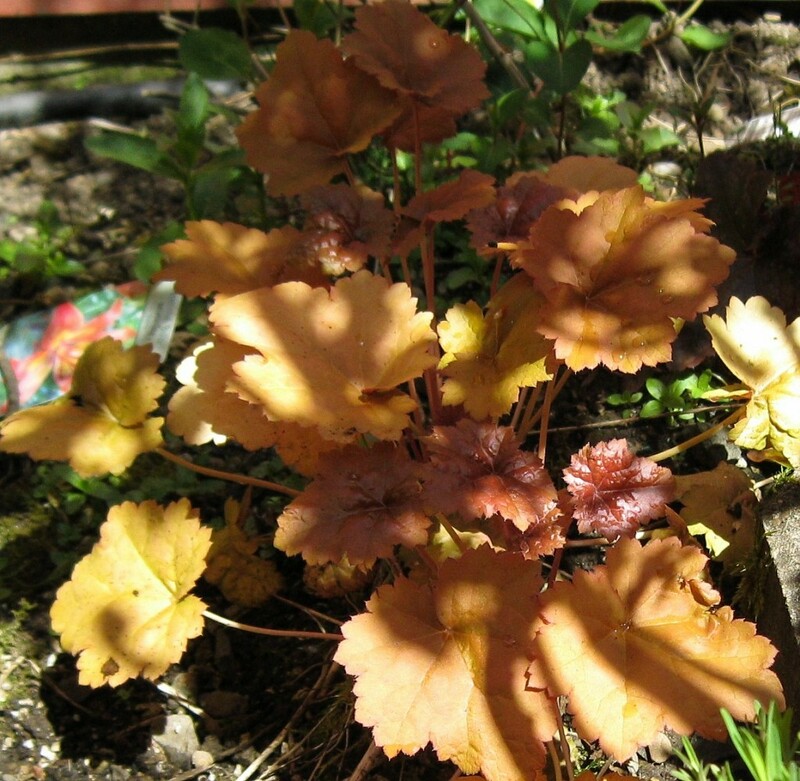 It takes my breath away in early spring and it gets prettier as the year goes by with its beautiful bronze leaves. the variegated honeysuckle is all leafted out and looking gorgeous withs its pinky green leaves. Te green bin is stuffed to the gunnels if a recycle bin can have gunnels, so I’m off the hook until the city comes and hauls away my bits and pieces and then it will be time to dig in again. I finished the day with my camera today, marking the turn of the year to my favorite seasons, spring and summer. 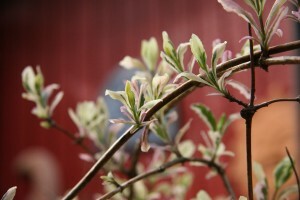 I love these shots, I tried to catch how I feel about spring in the photographs. Here’s one more of the clematis and a close shot of the hyacinth. 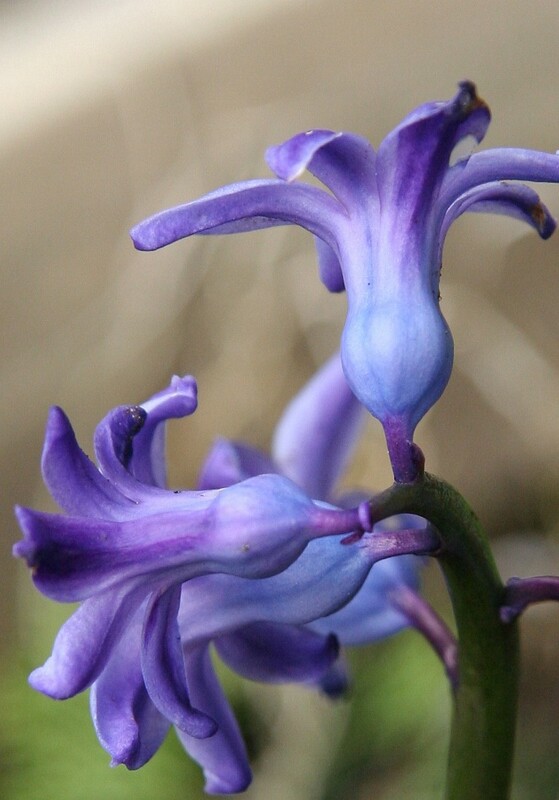 Amazing how flowers become so other worldly up close. The plants in the greenhouses and their friends are almost ready to come out too. As soon as the last frost goes away the greenhouse gets emptied! 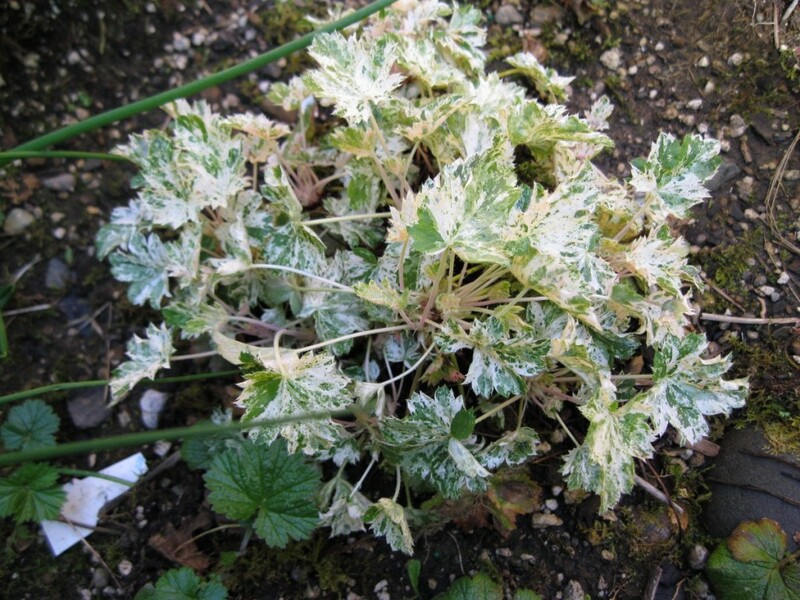 The green house plants are waiting until the last frost is over to make their appearance in the garden. 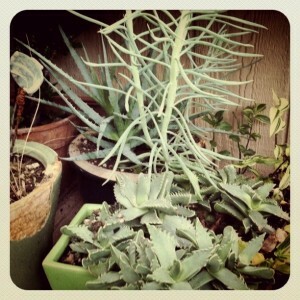 This entry was posted in Life in the Garden on April 10, 2011 by rox. 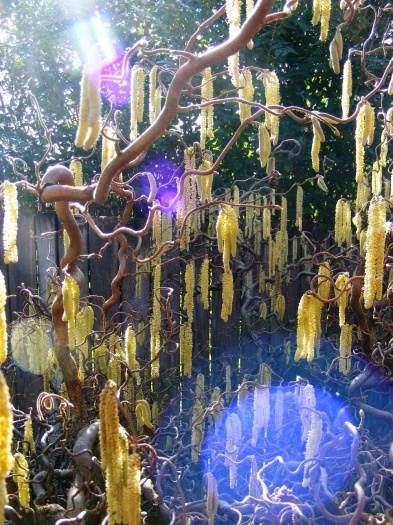 I have a contorted hazel, Harry Lauder’s Walking Stick is its real name, but in spring it is quite fantastic when you can see all its curly twisting branches before the thick cover of leaves shows up. 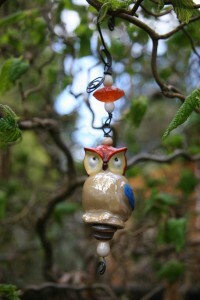 This entry was posted in Life in the Garden and tagged garden, garden art on March 10, 2011 by rox. I’m seeing violas, primroses and pansies for sale now. 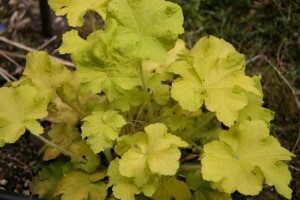 the first color in the garden. This year’s project is to get rid of the grass in back, enlarge the flower beds and put a berm with seating right across the middle. Can’t wait! 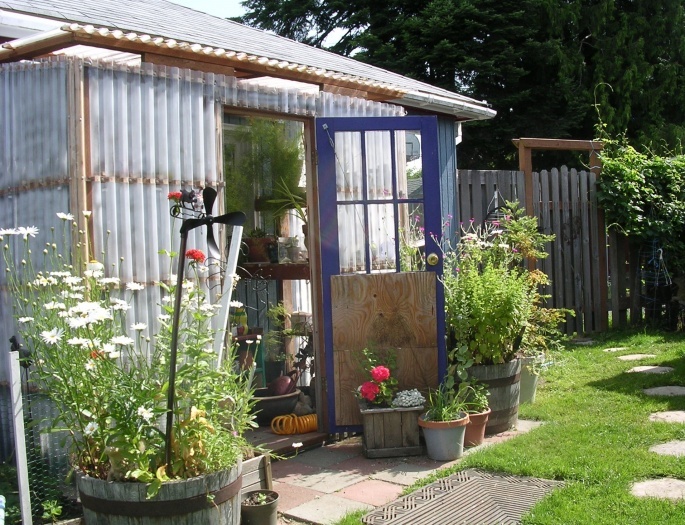 In the summer the greenhouse gets emptied out and everything goes to live outside. 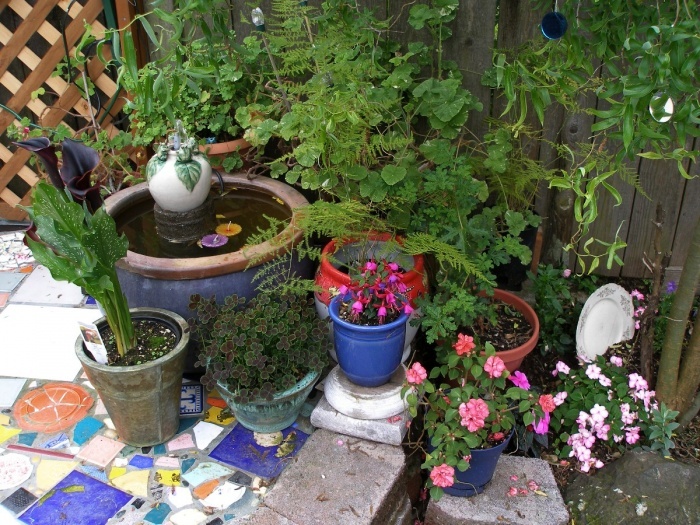 I love flower pots. 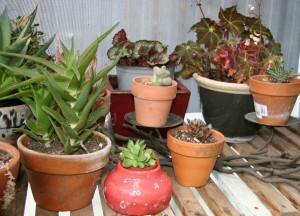 I empty them and turn them upside down for the winter so they won’t crack and freeze. 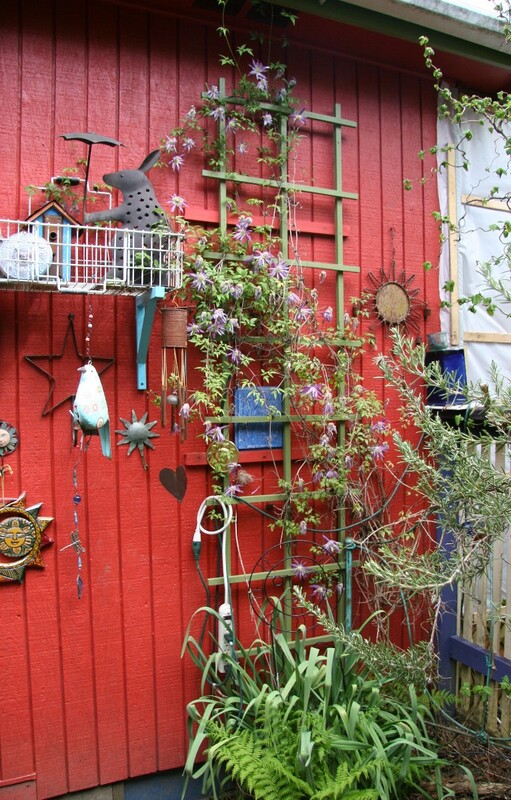 Its so fun to make groupings of color to add interest to otherwise boring spots. I have fountains everywhere. So easy to do, the animals all use them as drinking fountains and they add such a soothing note with their burbling and splashing.